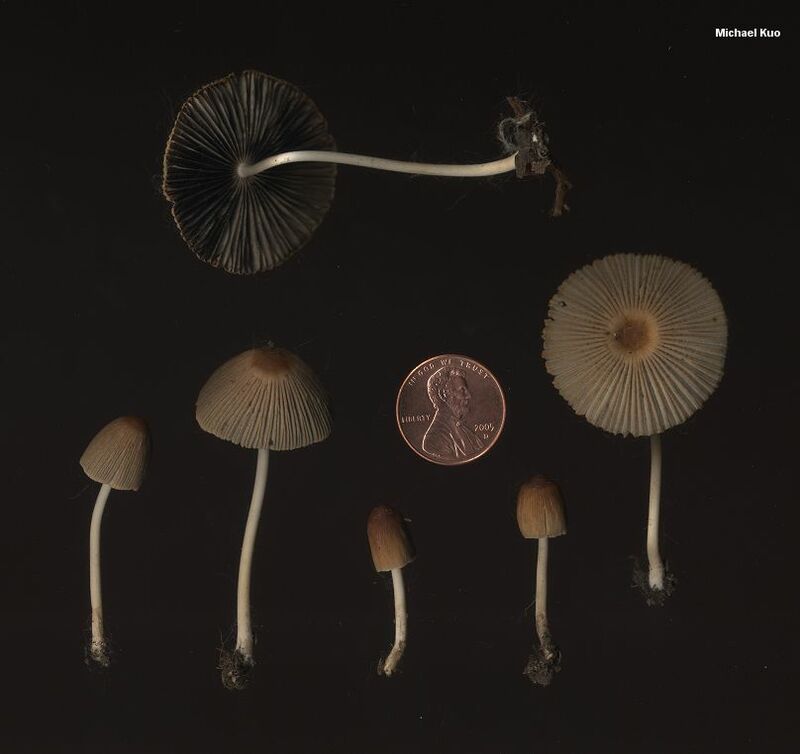 Among the tiny umbrella-like coprinoid mushrooms found in grass or wood chips, Parasola auricoma is distinct through a combination of macro- and microscopic features. 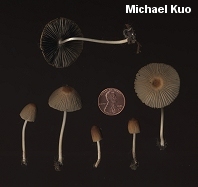 When young, its rusty brown to orange-brown cap lacks woolly or scaly veil remnants--and as the cap matures, developing grayish, umbrella-like striations, the center area remains smooth and orangish brown. 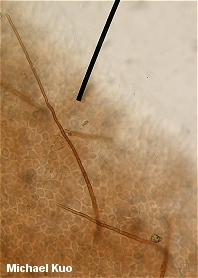 Under the microscope, Parasola auricoma features fairly large, ellipsoid spores and a cap surface adorned with very long, reddish brown hairs. 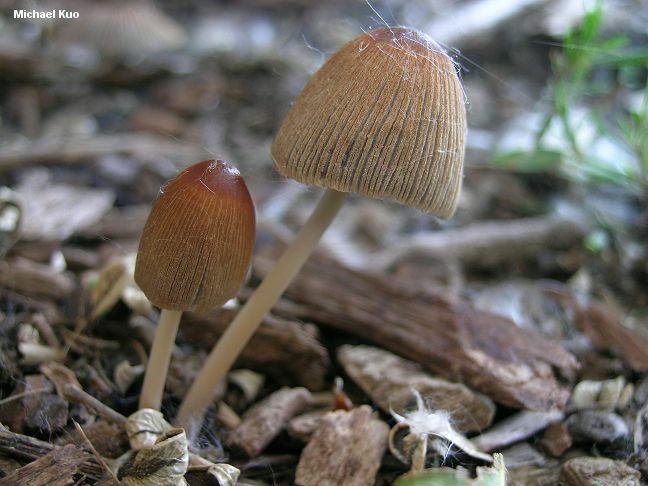 Parasola plicatilis can look similar when mature, but its young caps are not orangish brown. It differs substantially under the microscope. Ecology: Saprobic; growing scattered or gregariously on soil, in grass, or (more frequently) in wood chips; early summer, and sometimes again in fall (and over winter in warmer climates); widely distributed in North America. 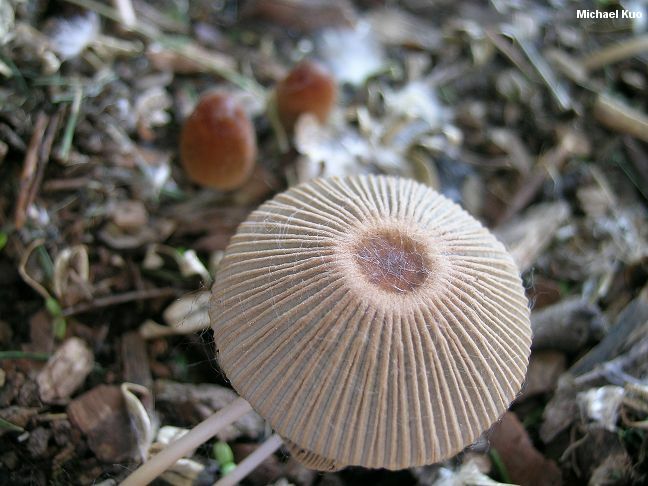 Cap: 10-60 mm across at maturity; egg-shaped at first, becoming convex or slightly conic, then nearly flat; bald to the naked eye (but finely hairy with a hand lens); becoming deeply grooved from the margin nearly to the center; orangish brown when young, becoming grayish in the grooves; without veil remnants. Gills: Free from the stem or nearly so; close or nearly distant; whitish at first, becoming dark gray and eventually black. Stem: 35-120 mm long; up to 3 mm thick; more or less equal; fragile; hollow; bald or very finely silky; whitish to yellowish; without a ring. Flesh: Insubstantial; whitish to grayish. 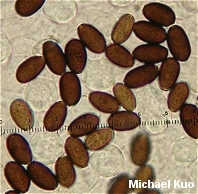 Microscopic Features: Spores 10-16 x 6-9 µ; ellipsoid; with a prominent, central pore; smooth; dark brown in KOH. Basidia 4-sterigmate. Cheilocystidia cylindric, fusoid-ventricose, or utriform; to about 90 x 25 µ. Pleurocystidia similar; to about 130 x 35 µ. Pileipellis hymeniform; setae scattered to abundant, dark reddish brown in KOH, thick-walled, to about 400 x 10 µ. Clamp connections present. REFERENCES: (Patouillard, 1886) Redhead, Vilgalys & Hopple, 2001. (Saccardo, 1887; Orton & Watling, 1979; Uljé & Bas, 1985; Breitenbach & Kränzlin, 1995; Uljé, 2001; Keirle et al., 2004.) Herb. Kuo 05271103, 05301101.